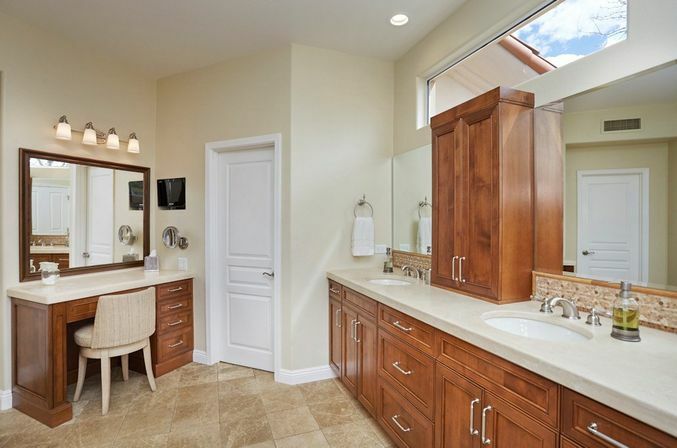 In most cases, the backlit bathroom mirror is done solely for decorative purposes – it is rare when it is intended to solve any functional problems. 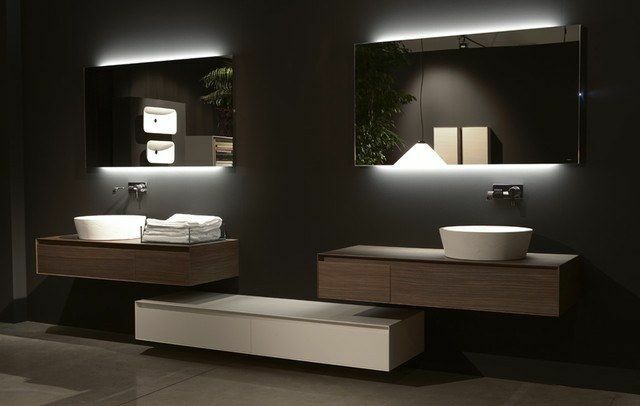 In general everything depends on the type and placement of lighting – if the lighting built into the mirror, it is purely decorative, but if it is placed so that it illuminates the man, its intended purpose is to provide the best visibility. 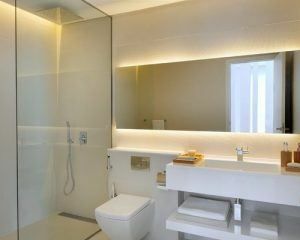 So, how to choose backlit mirror bathroom? 3 types of illuminated mirrors for bathroom: how to make correct choice? in the third situation the lighting device is placed behind the mirror. In the latter case, the backlight has a purely decorative purpose. Now a little more about all three types of mirrors. 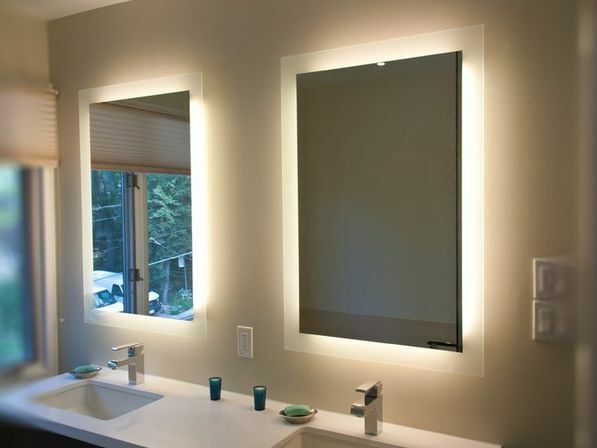 The wall mirror with external lighting. Variants of such products quite a lot – a portable lighting devices are equipped with lockers with mirrors, and just a hanging mirror. 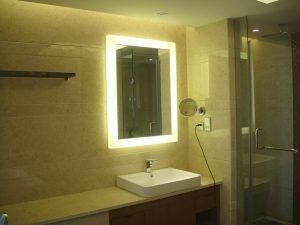 As lighting devices in such products can be used a single spot, adjustable spot lights and even small lights, installing directly into the glass. To choose such products you need based on your preferences. Mirror equipped with such lights, are functional and able to cover not only the person standing in front of them, but a certain area of the bathroom. The mirror with internal lighting. They usually use LEDs, the illumination of which is softened by the frosted glass, harmoniously integrated in the mirror itself. The price of these products is much higher than in the previous case is due to the complicated technology of fabrication of such mirrors. Mostly they are produced only in one version – in mirror cabinets. There are, of course, instances, and no cabinets, but it happens very rarely, and they are even more expensive than cabinet colleagues. The mirror with decorative lighting. 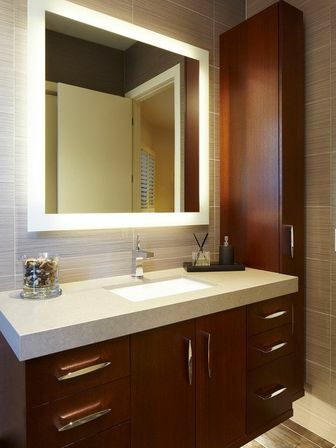 Such backlit bathroom mirrors do not carry a functional load, and its purpose is dйcor. Such a backlight can be positioned on the back side of the mirror, and built inside it. 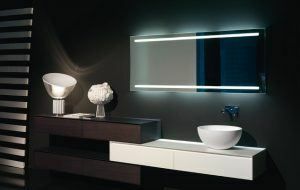 In the latter situation is highlighted by the glass itself, the mirror – small LEDs located on its end face and illuminate the glass from within. Here such options are sold in our stores. 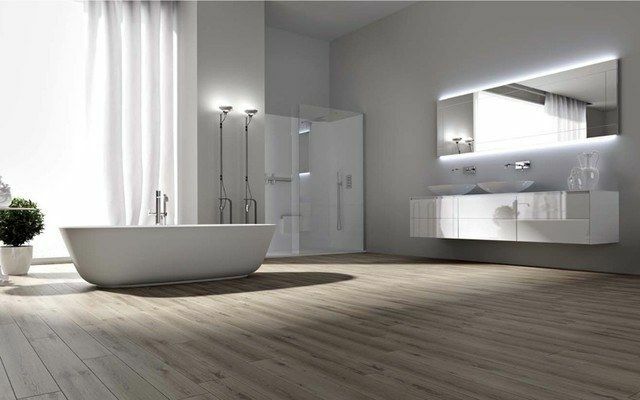 In addition, it should be understood that the mirror in the bathroom could have a different shape – in this respect will have to choose its configuration to match the interior of the room. The manufacture of the mirror with own hands is quite easy task – it’s all about the right approach to solving the problem. No one is forcing you to pick up the glass cutter and cut it by using refined patterns. It’s much easier – you are interested in the shape of the mirror is enough to draw on paper and indicate required dimensions. The rest of the work is done by people who work with glass and mirrors – and at the present time to find a glass shop almost on every corner. It is in these workshops are ordinary people, a highly trained glass cutter, cut out the right mirror and, if necessary, and cut a hole in it any size and shape. Now consider what we will need and which holes will be cut. It all depends on the type of lighting that you plan to equip your mirror is to buy and install can be as a led backlight, and special lighting for the mirror in the bathroom. They have to be in your presence because need their mounting dimensions according to which will be clipped in the mirror the necessary holes. 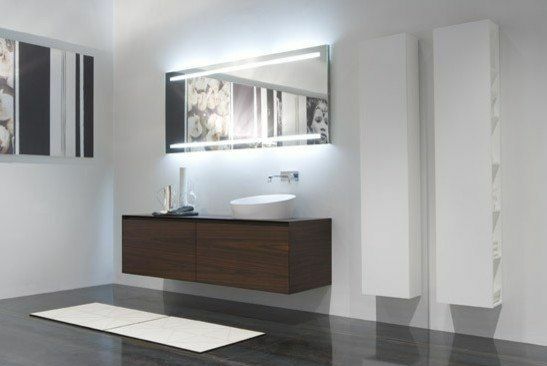 In another case the holes may not be necessary – lights for the mirrors can be manufactured in several variants: some of them require tie-in to glass, other installation on the wall, well, and some even clinging to the edge of the mirror using clothespins. You choose. 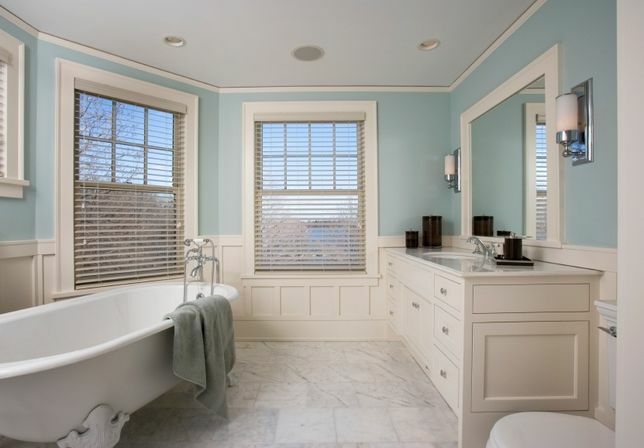 In any case, it is necessary to provide the cable in the wall to the liner lamp – in principle, you will only have to install the lamp and connect it to the electrical wiring. The rest of the work will be done in a glass shop. 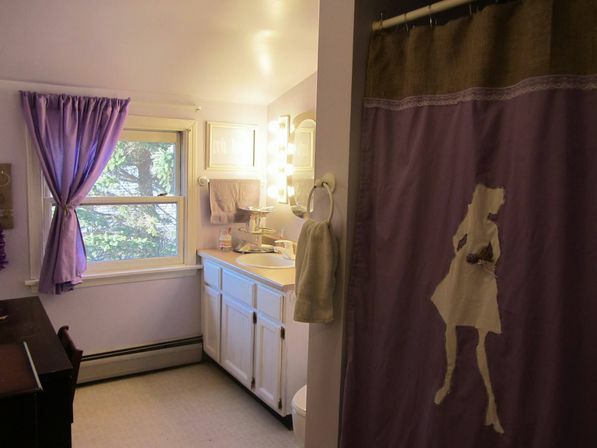 The idea is as old as the world itself – I suggest you to make a bathroom backlit mirror. Not all, of course, but at least its significant part. Such approach will allow not only organize a place for shaving and brushing teeth, but also visually expand a small space bathroom. The mirror can be installed, even if the repair is completed and laid tile – just some portion of it will have to be dismantled. It must be done as accurately as possible – take out only necessary a tile plot height from 1m to 2m above the floor, and then how it goes, depending on the size of the tiles. The dismantling is done from one end wall to the other. And yet, it is advisable to remove the tile without damaging the base adhesive to install the mirrors needs a smooth surface! After these preparations we measure the size of the cleared tile space and go to glass masters to order a mirror of the desired size. I want to warn at once – this piece of glass to deliver the home and install is problematic. 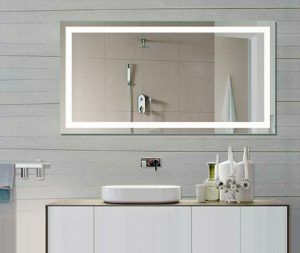 To solve this problem in two ways – either to order the mirror immediately with the installation, or you can divide it into several parts. The second option is more affordable, and joints of the individual mirrors can be covered later by molding. 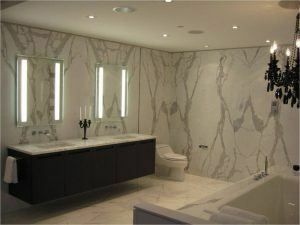 Besides, before the installation, you will have to take care of internal lighting mirrors. the second – to illuminate it with led strip. Led mirrors looks much more spectacular. It is done in the following way – buy a special aluminum profile for shelves with lighting. It is charging led light strip, after which the profile is put on the lower and upper part of the mirror – this caveat must be considered when ordering the product size. The ribbon connects to the electrical wiring through the power supply and the switch, and the mirror is stuck to clean from tile wall – usually used special mirror adhesive (e.g. liquid nails).